The WLP-1000 is a compact, lightweight, military ruggedized launcher positioner that is weapons and platform agnostic. 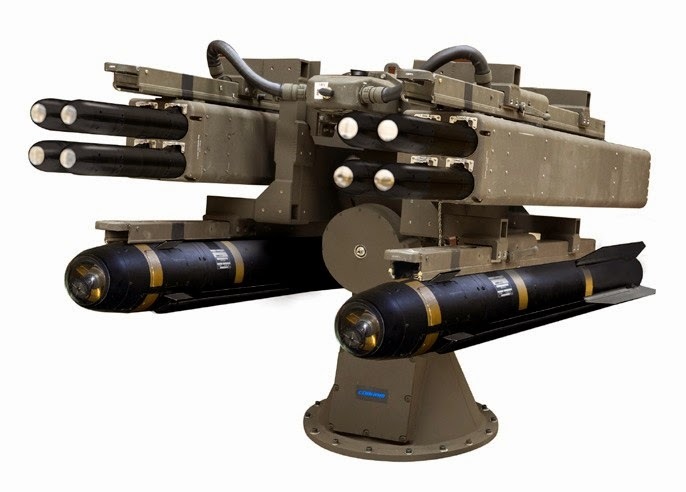 The positioner is easily configured to support existing M299; M310, M260, M261, and LAU-10 launchers. This modular 2-axis positioning system is optimized for size, weight, and power (SWaP), and incorporates a MIL-qualified servo control module for closed loop azimuth and elevation slewing and positioning. For the live-fire demonstration, the Cobham positioner was configured with four M299 launcher rails, associated cables and electronics, providing full compatibility with HELLFIRE® II and DAGR missiles. DAGR's rail-mounted canister attaches to the pedestal launch rails as it would on a standard HELLFIRE launcher designed for aircraft. Two test firings were conducted, one HELLFIRE and one DAGR, with flawless performance by the Cobham positioner. "Cobham is committed to supporting our customers with innovative solutions to complex engineering challenges," said Jeff Hassannia, Vice-President of Business Development for Cobham Defense Electronics. The WLP-1000 launcher positioner was developed by Cobham in 2012, and has supported three (3) other successful HELLFIRE and DAGR ground-ground tests, including one from the Lockheed Martin Joint Light Tactical Vehicle (JLTV).